Netanyahu is an accomplished speaker with the media. He is trying to move the United States closer to his own views on Iran’s nuclear program while minimizing the appearance of a difference between U.S. and Israeli positions on the issue. But, despite proclamations from figures like Vice President Joe Biden that “there is no daylight” between U.S. and Israeli positions on security, the inescapable fact is that such daylight is shining rather brightly between the two erstwhile allies. 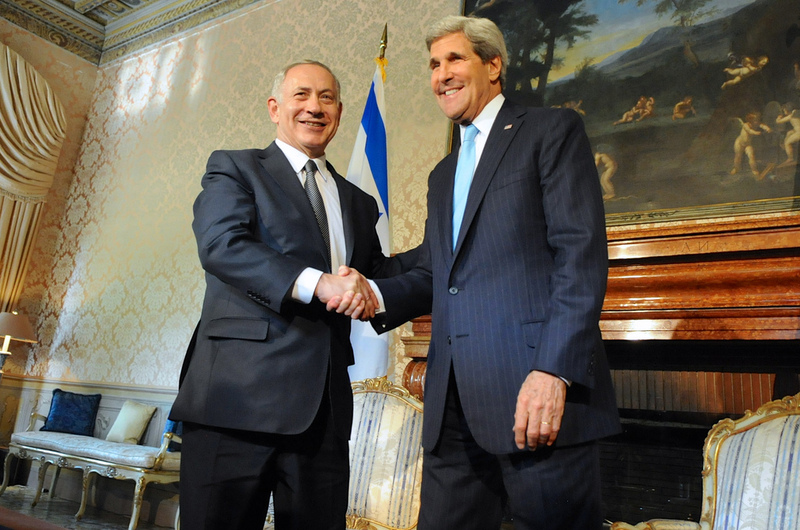 That light was on display when Secretary of State John Kerry met with Netanyahu in Rome. While speaking as allies who are in agreement on Iran, they said very different things about what they expect. Kerry stated again that the Obama administration would be seeking concrete proof of a peaceful nuclear program in Iran before lifting sanctions. By now, that’s a standard disclaimer, but it’s so self-evident that it really doesn’t need to be stated. Or it wouldn’t need to be said but for Netanyahu’s endless warnings about nefarious Iranian plots of deception centered around acquiring the nuclear weapon that both U.S. and Israeli intelligence agree Iran stopped any motion toward a decade ago. Following the aftermath of the Iraq War and Netanyahu’s blatant attempt to influence the US 2012 presidential election, Bibi has been pushing for more sanctions regardless of whether Iran is being defiant or cooperative. He has also been hinting at unilateral Israeli military action while saying he supports a diplomatic resolution. Netanyahu has refined, but not changed, that strategy in the wake ofIran’s new openness to dialogue with the West following the election of President Hassan Rouhani. Now he is more regularly pointing to specific aspects of Iran’s nuclear program, some of which can indeed be put to use in developing a weapon, but none of which are actually forbidden under the Nuclear Non-Proliferation Treaty (NPT), to which Iran — not Israel — is a signatory. The foremost security problem that we face, as you said, is Iran’s quest for nuclear weapons. Preventing that is a goal I share with you and President Obama. And you have said, I think wisely, that Iran must not have a nuclear weapons capability, which means that they shouldn’t have centrifuges for enrichment. They shouldn’t have a plutonium heavy water plant which is used only for nuclear weapons. They should get rid of the amassed fissile material. And they shouldn’t have underground nuclear facilities, underground for one reason – for military purposes. Here Netanyahu is arguing that an acceptable deal over Iran’s nuclear program should forbid Iran from the very same things that other NPT signatories have access to. The Israeli PM is saying this while calling for sustained sanctions on Iran plus more. The underlying hope here is that if Iran does win concessions, much of the existing sanctions regime would still be in place. All of this is geared not toward preventing Iran from acquiring a nuclear weapon but toward keeping Iran’s economy in deep freeze and limiting its ability to expand its influence in the region. And Netanyahu has some powerful assistance in this endeavor. Saudi Arabia is at least as concerned about Iran as Israel is. Few doubt that their unprecedented refusal of a seat at the UN Security Council, a spot they’d been trying to attain for years, was motivated in large part by their concern about a U.S.-Iran rapprochement. Their strategy may not be entirely clear (or, for that matter, well thought-out), but Reuters reported on Tuesday that the Saudis were planning a “major shift” in their relationship with the U.S. over Iran, the U.S. decision not to bomb Syria, and Obama’s refusal to support stronger Saudi measures to repress Shi’a protests in Bahrain. The implication that Saudi Arabia would entirely abandon its cozy relationship with the United States, perhaps for one with Russia or China, is probably a bluff. No other power can come close to America’s ability to fund and arm the Saudi monarchy and its Gulf allies. But they certainly can take some measures to diminish, though not eliminate, dependence on the United States with closer dealings with Russia and China. They could shift some of their monetary holdings away from dollars and U.S. Treasury Notes, and they also could do a lot to increase oil prices, which is a serious hammer to hold over what is still a very fragile U.S. economy. Thus far, however, the United States seems to be standing its ground in the face of these Israeli and Saudi tantrums. At the Rome meeting, Kerry held fast to what has been the Obama administration’s public position since the historic phone call between Presidents Obama and Rouhani. While we welcome, and we do welcome, the change of rhetoric, the change of tone, the diplomatic opening that the Iranians have offered through President Rouhani and Foreign Minister Zarif, we have made clear and we are adamant that words are no substitute for actions. And … we will need to know that actions are being taken which make it crystal clear… that whatever program is pursued is indeed a peaceful program… President Obama has made it very clear he will pursue a diplomatic initiative, but with eyes wide open, aware that it will be vital for Iran to live up to the standards that other nations that have nuclear programs live up to as they prove that those programs are indeed peaceful. I have emphasized the part about Iran being held to the same standards as other states that have non-weaponized power because that is a very clear open door that the Iranians can actually reach. With full transparency that confirms what intelligence services have been maintaining for over six years — that Iran stopped pursuing weapons research in 2003 — Iran can be free of sanctions and the threat of war. It is precisely this point that is sending Israel and Saudi Arabia into apoplexy. And we can expect both their rhetoric and lobbying to intensify over the course of the next year, a year which Iran has identified as the length of time that a deal can be reached. This will not be a simple matter. The politics around peace with Iran will become very intense. There will be real questions raised about whether the gains for the United States will outweigh the potential difficulties with Israel and Saudi Arabia — the US’ staunchest allies in the region for decades. Those won’t be easy questions to answer, but the overriding point will remain: Israel and Saudi Arabia need the United States even more than we need them (far more in Israel’s case). It seems like Obama and Kerry are subtly trying to assert that idea, which deserves popular support here.